Posted by dutchgrub	on Monday, November 12, 2012 at 16:56. 43 Comments. Our list of best Amsterdam brunches has been going strong since 2012. And while options were still limited back then, the situation has been improving ever since. So here’s our selection of the best brunches in Amsterdam. Turns out that our list, much like Amsterdam itself, is very international. It features brunch options from Australia, England, New Zealand and – of course – the Netherlands. While being from all corners of the world, they all share amazing food, friendly service as well as a passion for serving you the food you need to get you started after a long night. Bakers & Roasters is located somewhat tucked away in a side street of cosmopolitan De Pijp and blends in perfectly with its neighborhood. It’s young, hip and organic. The place is run by Kiwis and while all the food looks and sounds quite decadent, it is actually lighter than expected, the Kiwi way, sneaking in fresh ginger flavor or your daily dose of greens with all the grease and bacon. 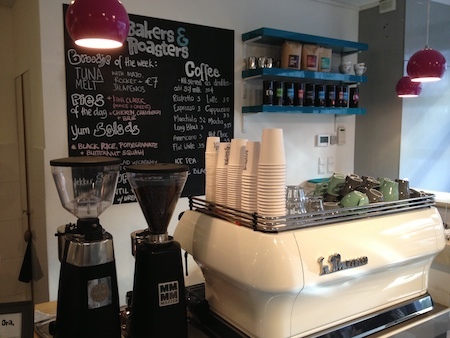 Bakers & roasters is semi self-service; you order at the counter, but are served your food at your table. The guests are very international and certainly more English is spoken than Dutch. The menu features a Kiwi brekkie, eggs in all varieties and lots of sweet dishes, cookies and cake. Gartine is a small and romantic breakfast and lunch room in one of Amsterdam’s typical side alleys. While somewhat tucked away, it’s recently become quite popular and gone from well kept secret to one of the places to be. The decor is old school, with quality furniture and antique cutlery and china. The food is organic, slow food style, with lots of interesting flavors and textures and heavy use of fresh herbs. There are dishes from different local cuisines with a focus on some Dutch staples such as sugar bread (suikerbrood), farmer’s cheese (boerenkaas) or apple syrup from Limburg (stroop). 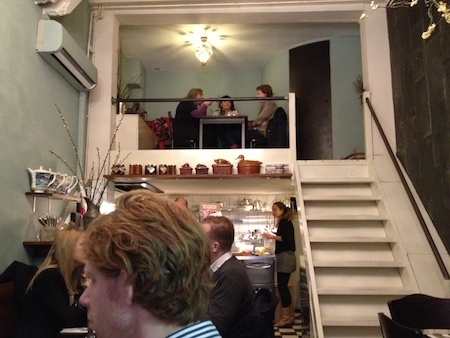 Greenwood’s serves English style breakfast in a small souterrain on the Singel canal. The atmosphere is friendly chaos. The place is usually packed, the tables are small and stacked high with food and all dishes are freshly prepared. Greenwood’s is great at serving a full English breakfast with eggs and beans. People also love all the home baked cakes and scones and most of all the almost famous soda bread that is otherwise hard to find in Amsterdam. The decor is distinctly worn which goes well with the unpretentious attitude. When the weather allows, there is a small makeshift terrace on the side walk right by the water. Little Collins, run by Aussies Charlotte and Georgina, is one of the friendliest places in town. The decor is bright and cheerful, the service always accommodating with a smile and the menu full of comfort food choices that will make sure you have a great day. Little Collins is located in De Pijp, but just away from the typical hustle and bustle, and invites you to lower your pace, start the day with one of their inventive cocktails, pour over the menu to decide whether to start with the standard “big one”, a healthy roasted vegetable salad, or a lesser known kedgeree, and eventually be lured into one of their excellent desserts. Lovefood closed doors in 2013 to work out a new concept to be revealed in 2014. Open for brunch Saturday and Sunday from 11am to 4pm. Public Transport: Walking distance from Central Station or trams 1, 2, 5, 13, 14, or 17 to Nieuwezijds Kolk. went to Greenwood’s this morning, and it was no disappointment. great burgers, tasty english breakfast, delicious sandwiches, marvelous cake. definitely recommendable! thanks a lot for this great tip! Glad you liked Greenwood’s! Sounds like you had quite a full breakfast. Nice! Too bad Lovefood is currently closed. Hope they will re-open. Are there any other brunch places you have been to and would recommend? I dont know if qualifies under brunch but De Bakkerswinkel is a real find. Great high tea especially at the Westergasfabriek location. Scones and jams with clotted cream are amazing. De Bakkerswinkel definitely has great bread and home made jams. And as long as you like it, it certainly qualifies! My picks have a broader menu with all sorts of eggs, sausages and more. Guess I like some hearty fare for brunch. Just wanted to thank you for all your tips, especially for the Greenwood’s address. That was an amazing brunch ! (I put a link to your blog on my post about Amsterdam, tell me if that bother you, and I’ll erase it). I’m naturally very happy about you telling people about dutchgrub and linking to my blog. Merci beaucoup! Aren’t all bloggers? Also went over to check out http://theflyingmuffininparis.blogspot.com/. Looks great. Will definitely come back when I need food suggestions for Paris! Glad you loved Greenwood’s so much! Anything else you really liked in the ‘Dam? Buffet van Odette is one of the few places I know that serves good eggs every morning of the week. They’re part of the €15 complete breakfast and well worth it on a lazy morning. Firstly let me say what a great website, I have spent the last two hours on it! 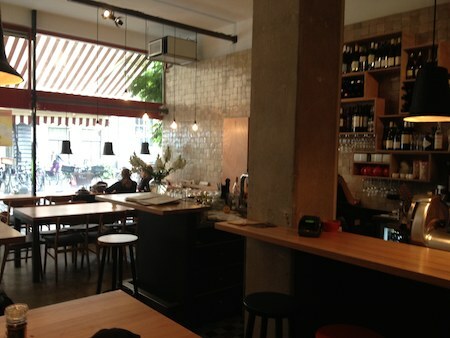 We are coming to Amsterdam on Wednesday and have been advised to visit Beems Brasserie, any thoughts? Glad you like our site! I have never been to Beems as it’s located smack in the tourist zone that I tend to avoid. Did you end up going? How did you like it? My favourite places for brunch: Stientjes on the Bilderdijkstraat, Villa Zeezicht at the corner of Singel/Multatuli bridge, Singel 404 on Singel, Toussaint on Bosboom Toussaintstraat, Pacific Parc in Westerpark, Wilhelmina on the Eerste Helmerstraat and when I’m with a large group, de Ysbreker on the Weesperzijde. Three others that I love are Festina Lente, Vredespijp and Latei, although their decor surpasses the lunch menu. Haven’t been to Yvette and Odette or Greenwood’s in years but they never disappointed. Franchise bakeries like de Bakkerswinkel and Vlaams Broodhuysch did. They’re kind of like Starbuck’s to me but with pastry and sandwiches. Nothing I ordered was good, from the coffee to the quiche. But the decor is nice. Can’t wait to try Gartine, Gebroeders Niemeijer and Love Food. Thanks for the tips! And how could I forget Sugarless? (http://www.sugarless.nl). It’s organic, has charming decor, doesn’t use any refined sugar and has wifi. Their food is really tasty. I hadn’t heard of Sugarless before. Sounds really nice. Will have to try it out soon. I have stumbled across your fantastic website and let me say: Thank you for the good tips! do you have any suggestions for me and my click of bachelor friends from the US (all non vegetarians) for a hearty sunday breakfast with a bloody mary at our side? Soon we will start at Opera Prima (patisserie/traiteur) at the kinkerstraat doing nice private sunday brunches combined with a Italian wine tasting…. It will start this sunday it will be a 5/6 course meal served with lovely wines…..
For more information check it out on facebook or give us a call at 020-6832383. Thanks for the suggestion. Didn’t know of The Really Nice Place. Will have to try it out soon! It might not count as a true brunch, except for the hours—Sundays until 2pm—but the breakfast at Cafe de Pels in the 9e Straatjes is great. The coffee is really good, as are the scrambled eggs Florentine, but they often sell out early. So many new brunch places. Incredible! Will have to find time to check out G&T’s really really nice PLACE, Little Collins and a few others soon! I would not recommend G&T’s (really nice place) unless you want to feel severely ripped off. The place looks charming upon entry, kind of like a squat. So it’s surprising that they ask Manhattan prices while they give SO little food. It’s kind of a crime to ask €11.50 for two tiny eggs with hardly anything on the side, or €10 for a small glass of mimosa. The €9 very tiny plate of Caesar Salad was wilted, with hardly any ingredients that belong in it (not even shaved parmesan or Romaine lettuce). The wine was pretty bad too. We were so disappointed. I would recommend Gartine, Yvette & Odette or Love Food. They might ask similar prices but you get a proper meal resembling a banquet, which tastes fresh and looks properly assembled. And you leave feeling full, not taken advantage of. I am a foodie as well; I absolutely LOVE good food. I just moved to Amsterdam from Portland, OR USA and have been spoiled by the great restaurants in Portland. However, I have to say I have found a couple nice places so far. A nice low key brunch spot I like is Bar Moustache on the Utrechtsestraat; they serve one of the best Croque Madame’s I have ever tasted. I have a trip to Paris coming up so I will let you know if I find a better one there. interesting… my name is Eriko and I just moved from Portland, OR! we’ll have to keep updating on food finds. i live in oud zuid so i’ve been trying out places down this way. we haven’t done brunch yet though. good to know! Yes, the Noordermarkt takes place each Saturday: http://www.boerenmarktamsterdam.nl/. It’s a farmer’s market around Noorderkerk, a church in the Jordaan, which is a great neighborhood to explore. I just found the list while looking for other brunch places in Amsterdam. Thank for the tips! I would definitely add A table, Kinkerstraat 10 (http://www.atableamsterdam.com), a new nice french restaurant with a lovely decor and a great brunch (croissant, baguette with home made jam, eggs with salmon and salad, tea, coffee, fresh orange juice and nice dessert like creme brulee)! The food is tasty and it’s not so expensive (i think like 15€). can’t wait to try the other places! Thanks for the comment, Anne. I updated the page with the website of Greenwoods. Too bad you haven’t added the brunchrestaurants to the map! I would like to add Hartig in the Heemstedestraat and Beter en Leuk with a Vegan brunch in Amsterdam Oost. You can find my restaurant and other “green” tips in Amsterdam on the map at http://www.groent.org/blog/map. Little collins in the pijp has great creative brunches. As for the bloodt mary my vote goes to G&Ts in the Jordaan. fyi, jason moved back to london without paying his staff back wages and now works a job in marketing, so dont hold yr breath for lovefood. Lovefood indeed had financial difficulties among others, which is terrible for everybody involved. I don’t know the details, but I am sure Jason would have paid salaries if he could. He indeed went back to London to work in advertizing, which is after all what he has been doing for most of his career. We hope he’ll be back in food some time soon, hopefully still full of passion and ideas, and also a little bit wiser on financials. Thanks for the suggestion, haven’t been yet. Any thoughts on the place? Are you involved with it directly or indirectly? G&T’s Really Nice Place is now G’s Really Nice Place. I second the vote for Omelegg on Ferdinand Bol. Very nice omelettes with interesting fillings. Nice staff. I also like Bakers and Roasters near Marie Heinekenplein and Little Collins for corn fritters with guacamole & salsa. So nice to finally have some choices for brunch! I think T went off to start her own thing, she does Bennys & Marys popup and some other things I think as well. 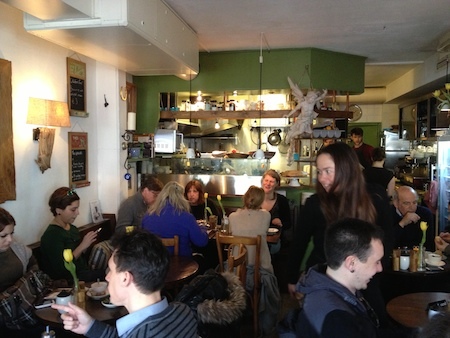 I’d put in another vote for Bakers & Roasters for brunch, it’s mighty popular! I love their salads in particular. I’m so happy there are now lots more brunch options around town. YAY! A Table has closed down. I liked the idea and decor, but after visiting twice I wasn’t such a fan of what they had to offer. Good to hear that Greenwood’s has received positive reviews lately. I haven’t been in over ten years because I found it was going downhill. There are a few new spots I haven’t been to yet, but they are popular: Sugar and Spice, and a place near the for vegans Koffie ende Koeck on Haarlemmerweg (right across the street from Westerpark). Fraiche does brunch on Sundays and they also started Staring at Jacob on the Jacob van Lennepkade, which has improved since the opening. I still haven’t been to Gartine, but everyone seems to love it. I’m not too excited about the savoury dishes at Bakers and Roasters, but next time I feel my sweet you’ll find me there. Their pastry selection looked amazing! In my opinion, expats do the best brunch places but one of my personal favourites is BarSpek, right at the very end of de Clerqstraat. I really like Drover’s Dog in Oost- they also have a second location in West. You should add Worst, next door to (and I think part of) de Marius. They offer vegetarian and non-vegetarian huevos rancheros, but I don’t think many people know about it. Without Lovefood’s breakfast burrito, this is one of the best brunch options for the large American contingent in Amsterdam who are utterly bewildered by British and Austrailian brunch menus. And speaking of vegetarian options, you should do a best of vegetarian eating in Amsterdam. I loved here two years before I discovered Betty’s, there are a number of amazing but somewhat hidden gems.